The June financial shopping numbers released by Compete revealed a mixed bag as interest in credit cards, home equity, and purchase loans fell double digits compared to a year ago. However, deposit activity moved in the opposite direction. Although credit card application volume was relatively flat (down 1% for the year and down 4% for the month), the number of shoppers decreased 39% compared to a year ago. Although the data shows only application volume, there has likely been a sharp drop in approvals, as underwriting standards stiffen and credit-worthy applicants stay on the sidelines. In June there was a slight drop in checking shoppers (down 4%) and applications (down 5%) compared to May. However, year-over-year both were up with a 32% increase in shoppers and a 6% increase in applicants. However, savings shoppers increased 51% from last year and 7% from May with applications up 43% compared to last year and 24% over last month. High-yield savings showed similar gains compared to a year ago, with 31% more shoppers and 30% more applications. Home equity and purchase mortgage activity were both off compared to the previous month and also a year ago. The only good news was an increase in refi activity with 10% more shoppers than May and 27% more than a year ago. But application volumes were down 21% from May and down 34% compared to last year. A little over a year ago, we introduced the Financial Services Monthly Performance scorecard produced by Compete. It summarizes the overall performance of 23 large U.S. financial institutions and lead-generation sites. Refer here for the detailed methodology as well as companies tracked. 1. Year-over-year comparisons were added to the chart beginning in March 2008. Because of ongoing methodology tweaks, the percentages in this table may be slightly different than if you went back to the data from a year ago and calculated the change. 2. Leads/applicants = Leads or applications depending on whether the site tracked is a lead-generation site or an actual lender. Now that we are well past the mid-point of 2008, it’s a good time to look at where we are with one of the most talked-about online financial subjects of the decade: person-to-person or social lending. Prosper: Through July, the leader in the market is running 10% ahead of its 2007 loan-origination pace. The company has funded $55 million and is on pace to do just under $100 million for the year. Website traffic is up 15% compared to a year ago (see graph below) and through July there have been 13% more loan listings (see previous coverage here, Finovate 2007 Best of Show video here; monthly volume reports here). Zopa: The company, which isn’t technically person-to-person (the loans are originated by six credit union partners) but definitely has a social aspect to its loan program, has not revealed any numbers, but they list 475 loans on the “browse all borrowers page.” Assuming average loan size of $8000 to $9000, they are doing less than $1 million per month. 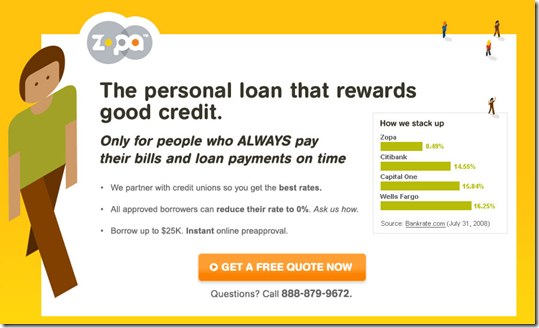 Zopa is using Google AdWords to pitch “instant approval” with a credit score of 640+ (see screenshot below), an aggressive marketing move, especially combined with the 8.49% APR touted on the landing page (see screenshot below; previous coverage here; FinovateStartup 2008 Best of Show video here). Lending Club: The company, launched in May 2007, has been essentially closed to new business since March as they retooled loans into securities for regulatory reasons. However, the company is scheduled to present at our Oct. 14 Finovate conference, implying that they will be out of their quiet period by then (previous coverage here; Finovate 2007 video here). Loanio: The startup appears to be very close to launching based on an a Sept. 3rd email sent to its house list announcing the launch “in just a few weeks” and adding in parenthesis (yes, we mean it this time!). The company will likely be the first to offer a co-borrower loan application (previous coverage here; Finovate Startup video here). Pertuity Direct: The newest competitor in the space is Pertuity Direct which we wrote about last week. Its website claims a Sept. 15 launch, and we look forward to seeing their first public demo at Finovate on Oct. 14. Finally, several companies are looking to launch P2P services in 2008 or 2009, including Globefunder, Community Lend (Canada) and one we just heard about today, Swap-A-Debt. 1. Specialists are involved in the student loan piece (GreenNote and Fynanz) along with Virgin Money and Loanback which help with person-to-person loan documentation and servicing. 2. Top-right graphic from April 2008 ABC News segment on Lending Club and person-to-person lending. In the year or so that they’ve been widely available, so-called reward checking, those high-yielding accounts that require a hefty number of debit card transactions (see note 1), have attracted quite a following. Although $5 billion isn’t even the rounding error across the entire $3-trillion U.S. retail deposit market, it’s real money to the smaller banks and credit unions offering the program. 1. Most accounts require 10 to 12 debit transactions per month in order to earn the high yield. For more info, see our previous coverage and Finovate Startup video here. 2. Upper-right graphic comes courtesy of First State Bank, Gainesville, TX. May continued to show increases in both deposit and home-loan shoppers while demand for credit cards edged downward. On a year-over-year basis, almost all segments are down with the exception of home equity and home purchase. 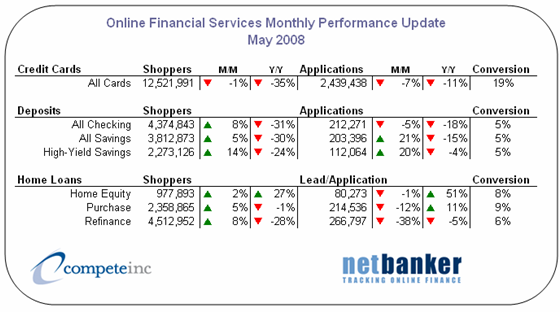 Credit card shopping was down slightly (-1%) compared to April and down 7% in applicants. Conversion also declined 2% over the previous month. Compared to April, deposits had big gains in both checking and savings shopping, up 8% and 5% respectively. Both savings and high-yield savings saw more than 20% gains in number of applicants compared to the previous month; however, both were down compared to a year ago. Despite increased shopping volumes, home-secured lending, as measured by the number of leads and/or applications, dropped compared to last month. The largest was the 38% drop in refinance activity. Conversion rates were down in all three loan categories, dropping 1% in home equity, 2% in purchase, and 4% in refinance. A year ago, we introduced the Financial Services Monthly Performance scorecard produced by Compete. 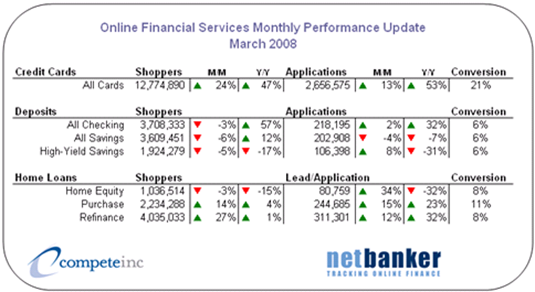 It summarizes the overall performance of 23 large U.S. financial institutions and lead-generation sites. Refer here for the detailed methodology as well as companies tracked. 2. Leads/applicants = Leads or applications depending on whether the site being tracked is a lead-generation site or an actual lender. According to Compete, website traffic to personal-finance startup Mint increased to 460,000 in July compared to 400,000 the month before, for a 13% increase. 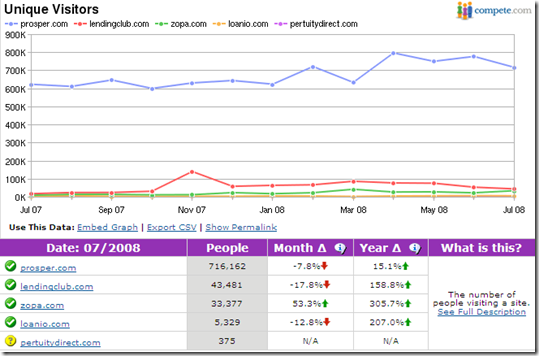 Site traffic has quadrupled since December, gaining 350,000 unique monthly visitors. 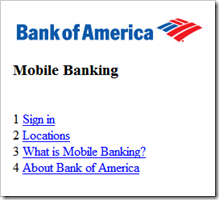 As expected, Bank of America reached the one-million-mobile-user milestone this week. 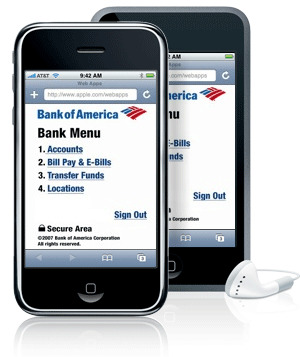 Last month the bank disclosed it had 840,000 active mobile users as of March 31. With 160,000 new users in the past 9+ weeks, it appears that BofA has stayed on the 75,000/mo pace of first quarter. Even more interesting to me was the news that the bank has "nearly 25 million" online banking users. That's 3 million more than the bank had last fall, an impressive 13% gain. 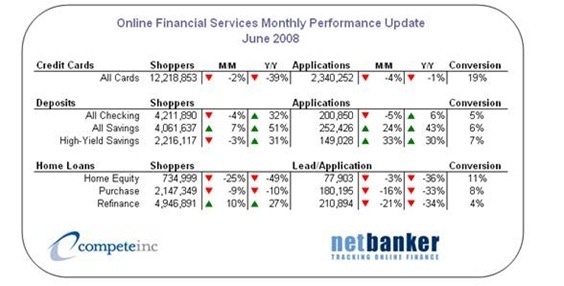 Six years ago, there weren't even 20 million online banking households in the entire country (see note 1). Change Sciences, publishing under the moniker of its new Kantuit research service, just released its latest financial services website evaluation. 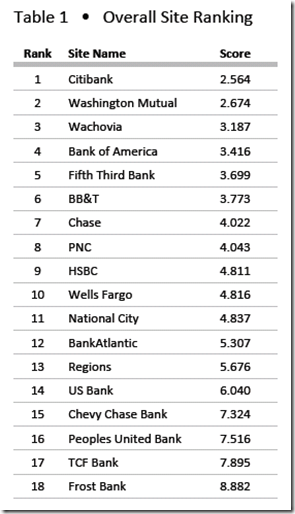 The report uses proprietary user-experience modeling to rate, rank and compare 18 leading banking sites on how easy it is to find, select, and open a new deposit account online (see Table 1, inset). Citibank and WaMu were ranked one and two and scored significantly better than the others. Wachovia was third, scoring about 20% higher (the lower the score, the better). Bank of America, Fifth Third and BB&T were in the next tier, finishing about 50% higher. Among mega-banks, U.S. Bank had the worst score, more than double the leaders. The Change Science score includes various components that show how a consumer may struggle with various aspects of the application process. These individual scores are totaled to come up with the final composite score shown in Table 1 right. Download an abstract of the research results here (registration required). The full report runs $4,000; a significant investment yes, but you could make that up with just a handful of additional good deposit accounts. In its latest quarterly financial results (here), Bank of America said it signed up 224,000 new users during the quarter to bring its active mobile banking base to 840,000. Assuming the 75,000/mo pace continues through second quarter, the bank should be over 900,000 now and will surpass 1 million in the next few weeks. Although it’s a nice milestone, it’s only 4% of the bank’s 23+million active online banking users (here). Given that mobile is pushed frequently in the bank’s online banking area, one could argue that 4% adoption is pretty anemic. But according to M:Metrics, less than 14% of U.S. mobile phone users accessed info via the mobile Web in February. So 4% of a 14% universe is much more impressive, indicating the bank has tapped almost 1/3 of the short-term potential for mobile Web-based services, a good start. To really goose adoption, text-based solutions may need more emphasis (see Chase screenshot below). According to M:Metrics, U.S. text users outnumbered mobile Web users almost 4 to 1 in February, 110 million to 30 million. These adoption rates are about what we expected. In the forecast published a year ago in our Online Banking Report on Mobile Banking, we were relatively bearish short term, projecting 900,000 mobile users by year-end 2007 growing to 2.5 million by the end of 2008. With BofA reporting 840,000 and assuming they have about half of all users, the U.S. market has likely already passed the 1.5 million mark and will end the year at more than 3 million. The adoption rate depends on how hard banks push mobile options. 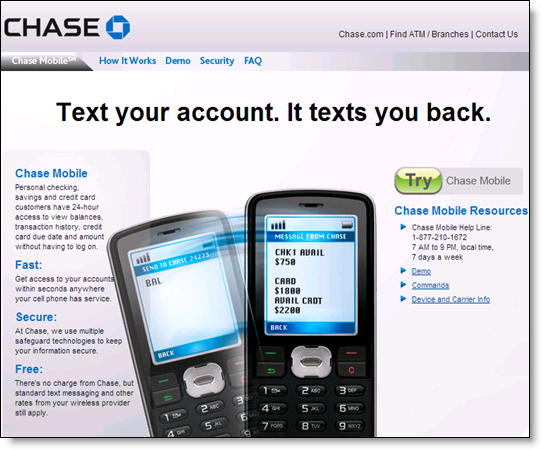 Along with BofA, Chase has been one of the most aggressive, showing mobile use in its advertising for several years now (previous coverage here). I love its “Text your account. It texts you back.” Just seven words conveying more than most 3-minute demos. According to data from Compete’s consumer panel, March rebounded from the lower traffic in February. Every product, except standard savings accounts, posted increases in the number of applications. Credit cards were the biggest gainer (up 24% in shoppers, up 13% in applications) following sharp declines the past few months. Home loans market performed similarly, with double-digit increases in applications for both purchase (up 15%) and refinances (up 12%). New this month, we have valid year-over-year comparisons shown (see note 1). Compared to a year ago, both checking and credit cards applicants and shoppers have risen significantly. Home loan shoppers are up slightly, but applications are up. Credit cards saw a large jump in both shoppers and applicants. The credit crisis seems to have benefited the credit cards market as applications, especially for balance-transfer cards, have increased. Compared to a year ago, shoppers are up 47% and applicants are up 53%. However, conversion dropped by 2% from February. Deposits saw overall shopper loss in all three segments during March, but applications for checking were up 2% as were high-yield savings (up 8%). 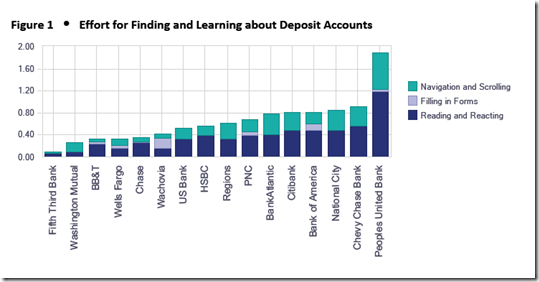 Last year at this time, deposits were increasing across all segments. In March of 2008, however, applicant levels are below what they were in 2007 with 31% drop in high-yield savings applicants and a 7% decline in all savings accounts. After a terrible February, refinance mortgages posted a 27% gain in shoppers as well as a 12% gain in applicants. Year-over-year refinance applications are up 32% from a year ago. Purchase mortgages also saw a similar improvement from last month with a gain of 23% over last year. Home equity had the largest gain in applications in the month of March as leads/applications (note 2) grew 34%. Year over year, however, applications are down 32% due to the housing crisis of the past few months. 1. New this month: Year-over-year comparisons are now included in the monthly table. Because of ongoing methodology tweaks, the percentages in this table may be slightly different than if you went back to the data from a year ago and calculated the change. In an unscientific poll of 500 Facebook users (see note 1), we found that 13% of respondents are interested in accessing their bank balance through their Facebook account (red bar below). While that’s not exactly a ringing endorsement of the idea, it’s potentially enough early adopters to get the service rolling. Most of the interest emanated from younger segments. For example, 18% of 18-to-24 year-olds said they’d probably use Facebook banking (gray bar below) compared to about 5% of the 25-49 group (green and yellow bars below). But it will take education to move “Facebook banking” into the mainstream. The majority of respondents, 70%, said there is “no way” they’d bank within Facebook and another 13% said probably not, resulting in a strong 83% negative rating. Given well-founded concerns surrounding online security, that’s not surprising. 1. Survey was conducted April 9 through Facebook’s polling mechanism. Total respondents = 500. Respondents are self-selected so the results should not be used to forecast specific demand.